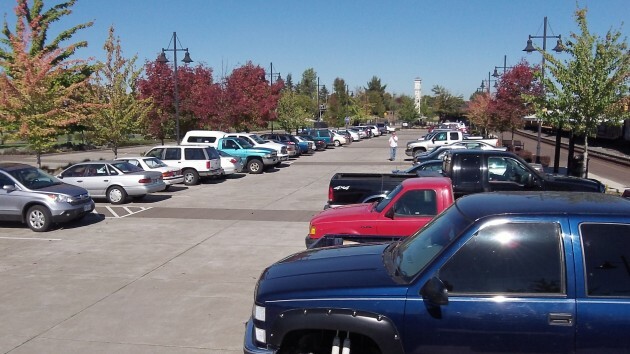 The parking lot at Albany Station was nearly full on Friday afternoon. A nearly full parking lot at Albany Station on a weekday afternoon reflects the interest in train and bus travel up and down the Willamette Valley and beyond. It also suggests that it might not be too soon to look for expanded parking, which will be needed if plans to increase train service ever yield results. On Friday afternoon, I climbed on the back of my truck and shot this image. Then I walked up and down the rows and counted 63 vehicles, not including mine. Only about a dozen parking spaces were open, and some of those are restricted to only one hour. As it happens, a former car lot on the southwest side of the station’s parking lot is for sale — or was the last time I looked. Whether more parking will be needed may depend in part on the drawn-out process of trying to upgrade passenger rail between Eugene and Vancouver, B.C. Since 2012, the Oregon Passenger Rail team and a leadership council of elected officials have been studying potential new track alignments in order to shorten the trip between Portland and Eugene to less than two hours. They picked two routes for further study. In the segment between Eugene and north of Albany, one follows the Union Pacific Main line that passenger trains now use. The other runs along Interstate 5, which would require a new Albany station, but one option for that alternative would be a detour off the freeway to make use of the existing station. The Federal Railroad Administration has approved the two alternative routes for continued study under the “Tier 1” environmental evaluation, which is what’s been going on all this time. So are we getting close to some real results? Nope. All this planning until now was merely preliminary. This month the rail project outlined the “next steps.” Take a deep breath: “The next steps are: 1. The project team will begin more detailed study of a No-Action alternative and the build alternatives approved by FRA. When completed, the Tier 1 Draft EIS will be published for agency and public review and comment. “2. After considering agency and public comments, ODOT will recommend a Preferred Alternative that will be presented to the Leadership Council, Oregon Transportation Commission and the governor’s office for concurrence. Following concurrence, ODOT will forward the recommendation to FRA who will identify the Preferred Alternative. Methinks many of those vehicles don’t have anything to do with AMTRAK other than using their parking lot. Early & late passengers may be parking and taking the LOOP bus to downtown Corvallis. Since parking at LBCC can be crowded during school, that would also be a convenient place to park and use their student ID to ride the local bus for free. Well two comments here. One about Mr. Herring’s story and one about Mr. Kapaun’s comment which I’ll probably get “flamed” about. 1. Why does the LOOP and city bus system that loses enough money on it’s own give free rides to students? Is this just nursing them along into the “entitled” mindset? 2. Mr. Hering, how much duct tape did it take to keep your head from exploding when reporting the “next step(s)” involved in planning expanded rail service? What governmental bureau-speak those sentences were. My compliments on keeping your head in one piece. I do hear that early in the term there is no parking at LBCC at times. And a lot of buses stop there because it is supposed to be multimode. So i am sure it is inconvenient but sometimes people do out up with inconvenience. I did some Fermi numbers from the net to give you a story problem. The pacific corridor has lass than 50 million people. The Albany Lebanon statistical area has less than 200 thousand people. Amtrac on this cascades route has less than 100 thousand riders per day. So my number is ten passengers per day board here. This seems low to me but it may end up excluding the amtrac bus links that amtrac offers instead of rail. And as a Fermi number is can be easily off by up to an order of magnitude. Or maybe we could ask amtrac? Or run the count again in mid November when lbcc had settled in. It looks to me that amtrac loses over a billion dollars a year mainly in CAPEX. I am sure there is a lot of deferred maintenance involved but also trying to improve the infrastructure. We can hope they can eventually offer 100mph service here. But this is not what the world tech leadership considers impressive anymore. Now your state legislature has to kick in money on this particular CAPEX and everyone up and down the route has to also. So there are a lot of signoffs. As far as buying the parking lot that is relatively cheap and may be a wonderful idea. I do wonder how to get across the street. Maybe we should also buy some more land for parking near lbcc. We could also pull more transportation services into the multimode hub. I enjoy taking the train. HH, they do take bikes! AMTRAK Cascades runs between Eugene and Vancouver BRITISH COLUMBIA. Let’s face it, the Eugene to PDX portion is a drop in the bucket compared to the Puget Sound area portion. It probably even makes sense between Seattle-Tacoma with the crowded freeways in that area, Often traffic is at a near standstill during commuting hours. The amount of times out trains are actually up to speed is a minor portion of our local trips. A faster train would just be slowing down a few minutes sooner. What people fail to see are the costs that will be added on afterwards if we do get “fast” trains. Guess what- The tracks aren’t suitable for 100 MPH trains, which they will act surprised about AFTER they’ve purchased them. So, they’ll spend several times more than the train cost for new tracks. Sad part will be 2/3 of their trips will still be by contracted buses running on the freeway. Thanks for the correction. Of course: Vancouver, B.C. !